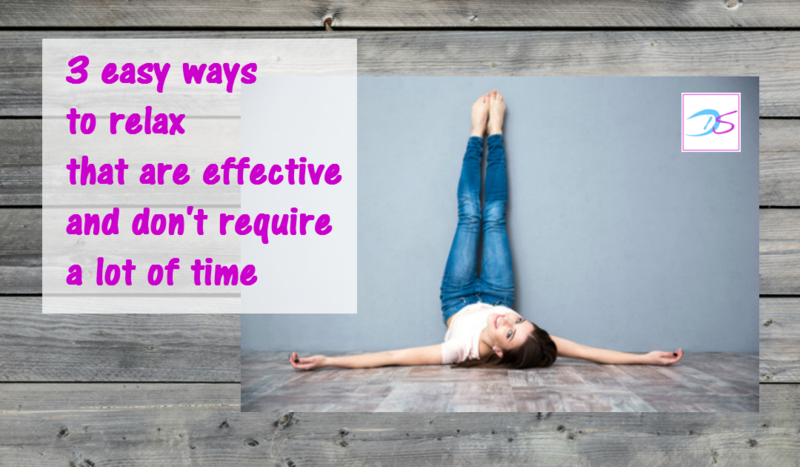 Do you want to relax and de-stress but don’t know how to fit it into your busy schedule? Or do you not take time for relaxation because with everything that’s on your to do list it seems like being lazy and would come with feelings of guilt? I have good news for you on both levels! If you have read some of my previous blog posts, you know I’m a big advocate for making relaxation and stress management part of your routine, so let’s first take a look at how we can re-frame how you feel about taking me-time to relax and then I’ll give you 3 simple ways to do it effectively without spending a lot of time on it. Taking time to relax and de-stress is not being lazy, it’s a necessity for taking good care of yourself and your body. Relaxation helps you to recharge your energy, tap into your intuition and creative self, it’s time to let go of worries that way you down, time to feel centered and clam which in turn fuels your happiness, self confidence, libido and sense of humour. Apart from yourself, think who would benefit from you being full of energy, creative, confident and fun? Your partner, your children, your friends, your colleagues, your boss, …! So no more putting off relaxation time, you deserve it and everyone around you will benefit too. This posture has a calming effect on your nervous system. This is how you do it: you lie on your back with your sit-bones as close to the wall as feels comfortable for you. Then you extend your legs up the wall with the backs of your legs resting against it. In yoga this posture falls under ‘inversions’ which generally place your heart lower than your head bringing more blood, nutrients and oxygen to your brain (think of headstand or handstand).With “legs up the wall” you create the inversion through putting your legs up even though you don’t quite bring your heart higher up than your head. The big advantage of this posture is that it is effortless, it’s a resting position that doesn’t require muscle strength. You can do this on your bed before going to sleep or any time during the day when you have a chance to take this posture. If you work in an office, you may want to do it when you come home as a nice relaxing transition from work to family time. Have your kids join in. Deep breathing is very relaxing and also has a calming effect on the nervous system. This is how you do it: inhale counting to four, hold your breath in counting to four, exhale counting to four then keep your breath out counting to four. Repeat a few rounds. One round only takes you 16 seconds and three to four rounds can already have a noticeable effect especially when you apply it in a situation of acute stress.When you count while you are breathing you keep your mid fully concentrated on the breathing too which means that there is much less chance that your mind will wonder off to stressful thoughts. It may need some practice, if you feel your mind wandering, let the thoughts pass through like a train and resume the counting.If you combine ‘4-count breathing with ‘legs up the wall posture’ you can get into an even deeper state of relaxation. You may already know that meditation can bring lots of benefits from calming the nervous system, to enhanced focus and alertness, more creativity, improved immunity and much, much more. Have you thought about making meditation part of your routine but don’t know where to start? Or has the thought of having to get up an hour earlier to meditate or finding another undisturbed time slot during the day led to dismissing the idea altogether? That’s how I felt about it until I found an easy, fast and effective way. Granted, it may not be the perfect thing but it’s much better than not meditating at all.This is how I do it: All it takes is 12 minutes!I listen to a 12 minute guided meditation (so no figuring out what to do) that makes use of brainwave entrainment. This means that the audio I listen to encourages my brainwaves to sync up with the frequency of sounds embedded in the meditation. Brainwave entrainment can be used to influence brainwaves to sync with different frequencies. For the purpose of meditation the idea is to stimulate alpha brainwave activity in the 8-13 Hertz region which puts you in a state of relaxation and effortless alertness. At the end of the meditation my brainwaves are brought back to beta brainwaves that are associated with waking consciousness. I know this works because on occasion I’ve fallen asleep while listening and find myself waking up at the end of it, catching the last few words of the guided meditation. These short brainwave entrainment meditations are called zen12*. I use them, I enjoy them and I’m happy to recommend them. You can find more information on them here*. *Should you decide to purchase the zen12 meditations, I would appreciate you using the link in my post. I have not been asked to advertise this product, I’m doing so because I enjoy using it and I earn a small affiliate commission on the sale. Thank you.